For those of you not old enough to get the joke, sorry. Deesings posted a weekly update from the McKinney campaign, but I wanted to bring the headline, as I see it, to your attention. The headline is, Cynthia McKinney is still in the running to secure federal campaign matching funds. How you may ask? By seeking the Peace and Freedom Party nomination in California, and they are not slated to finalize that decision for a couple of weeks. This means that we can secure more than $100,000 for the McKinney campaign. We know what McKinney’s goals are. They involve ballot access, so if you believe that is important, donate here. Her plans involve supporting local candidates, so if you think that is important, donate here. She has a vote goal of at least 5% nation wide, so if you think that is a worthy goal, donate now. On a more personal side note, I would also like to encourage folks to also donate to Jesse Johnson’s campaign. He has campaigned actively and has worked to secure ballot status in other states. kat swift has also led the way on ballot access, gathering signatures and campaigning hard across the nation. Her speeches were, by all accounts, well delivered and well received at the convention. Donate here to support kat’s hard work on our behalf. Kent Mesplay has run for our nomination twice, and this run was both exciting and more expansive than the last run. As an actual scientist, Kent brought a sort of weight to his arguments that made plenty of Greens support him. You can donate here to his campaign. kat swift told me last week on Green Party Watch Radio that she had donated $10 to each of the candidates because she knows money matters. I am here to tell you loud and clear, it matters a lot. We have a chance to put perhaps as much as $150,000 extra dollars in our candidate’s pockets by donating to her campaign. Give as much as you can possibly afford, minus $30. Give that $30 ten dollars at a time to the other three candidates, and you will be helping build up a karma bank we will always benefit from. Have you ever written something you think is pretty good, and then your computer burps and it all disappears? No, of course you don’t, because you use software that automatically saves your work as you go along, but noooo…I have to use a text editor instead, and lost every word when the lightening struck. Oh well…life goes on. As I struggled through the first five or ten minutes of this week’s report I got a call from kat swift, candidate for the Green Party presidential nomination. I had tried to get kat on earlier, but we never linked up to make it happen until today. There is no doubt that portions of the interview are difficult to understand since the audio is rough, but kat did make points many of you will like to hear. For example, kat has tried to focus on domestic violence, not only between adults, but between adults and their children. She’s also focused on not only closing down all foreign military bases operated by the United states, but also on repairing the environmental damage done by those bases over the years. She’s also focused on the broad range of sustainability issues Greens understand better than many non-Greens. Perhaps the most exciting things to hear from kat were her encouragement of Greens to donate to Cynthia McKinney’s campaign in hopes of earning her federal matching funds, and her call for Green Unity. Give a listen by clicking here. The Green Party of Michigan‘s State Convention will be held July 26-27 at the Franke Center for the Arts, 214 East Mansion Street, in Marshall, MI. at its convention July 10-13 in Chicago. finished second with 17% of the vote and three delegates. will go to the convention uncommitted. Thanks to Lou Novak for the information. A short video of Presidential candidate Kat Swift is starting to get some attention. Part of it includes Kat Swift at a parade dressed as Wonder Woman. I’m an old comic book “fan boy” (my wife has made my daughter’s Halloween costumes since she was born including both Supergirl and Wonder Woman) so seeing one of our Green candidates dressed like a Superhero was, for me, kinda cool. The video is a short, mildy edited snippet of what appears to be an emerging documentary by Polidoc Productions about the Green Party 2008 Campaign for President. The quality of this and the other short videos indicates that this documentary, when completed, will be a must have for die hard Greens. I love how the video overlays the wonder woman costume with the fact that kat is collecting signatures, fighting for ballot access, and is running a “working class” campaign for President. Green National Committee member Diane F. White of PA sent a couple of links to Green Party Watch from the Keystone State Green website. The first discusses ballot access laws in PA which are amongst the nation’s most restrictive, and the candidates seeking the party nomination. The second announces the results of the state convention, including McKinney’s winning of almost 53%. “No candidate” came in second, with Nader, who is not running for the Green nomination, at third, followed by Jesse Johnson of WV, Kent Mesplay of CA and Kat Swift of TX. Uncommitted was in last place, and one delegate was allocated to that position. 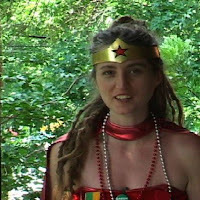 Kat Swift, Green Party activist from Texas, and one of four candidates seeking the Green Party nomination for President of the United States. Video created by Polidoc Productions.